*Disclosure: CraftProjectIdeas.com provided most of the supplies used in this project. Project idea and opinions are my own. There are Amazon Affiliate and other affiliate links in this article which means, at no additional cost to you, we could receive compensation for our recommendations. You can read our full disclosure policy on our Disclosure Page for more details. 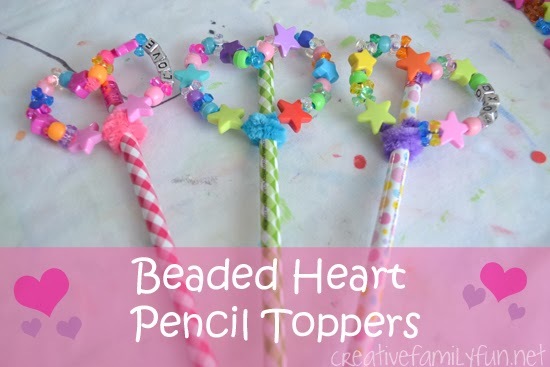 But, if we did, we would have made even more of these fun beaded heart pencil toppers. 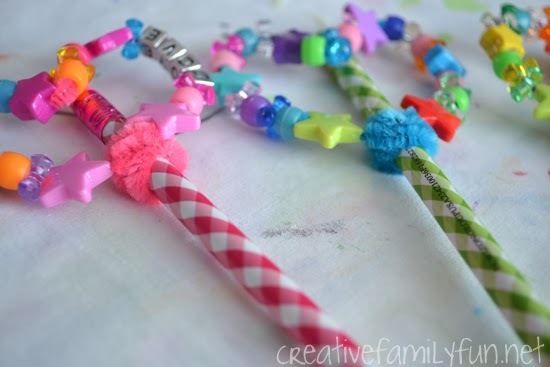 Add a simple gift tag and they’re ready to hand out to classmates – no candy required. 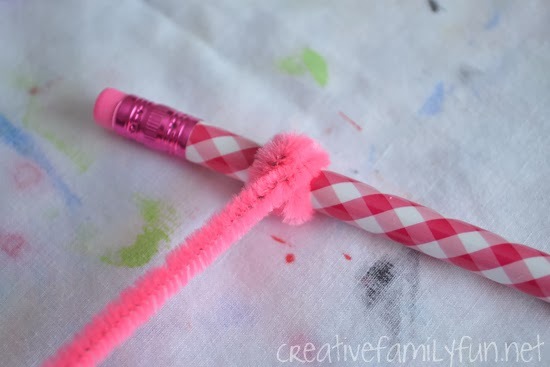 To start the process, wrap one end of your fuzzy stick around the pencil. Wrap it around tight enough that it doesn’t slide up and down by itself. Next start beading. 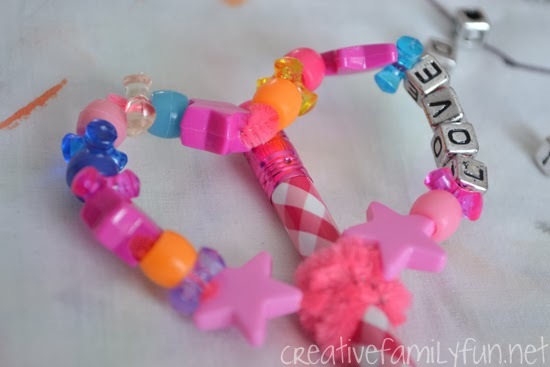 We had a variety of beads: pony beads, tri-beads, fun star beads, and silver letter beads. The type of bead doesn’t matter, so use whatever you think looks best. 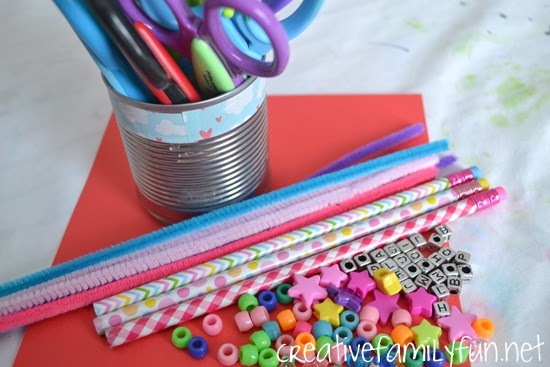 Keep beading until you are left with a long enough section of your pipe cleaner to wrap around your pencil again (at least 2 inches). I bent my stick in the shape of a heart before beading so I could see how my pattern was going. This step is not necessary. We made patterns with our beads. We even spelled a few Valentine’s words, like “love” and “xoxo”, on a few. It would be fun to spell out classmates names! Once you are finished beading, wrap the other end of your fuzzy stick around your pencil at the same place as you began. Overlap the initial wrapping so that the two ends stay together. Shape your beaded stick into a heart. Pull the heart down so that the entire shape rests against your pencil. 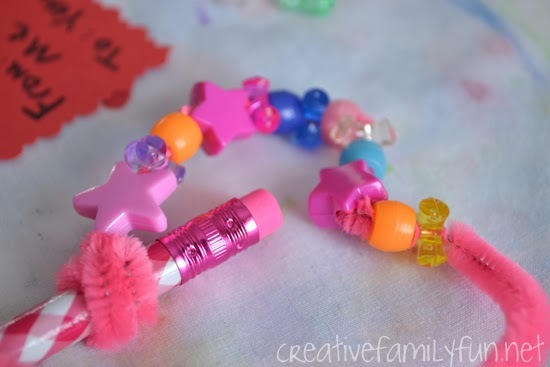 We left ours like this, but if you want to add a bit of stability, cut a small piece of pipe cleaner and secure the top bent section of your heart to the pencil. Wouldn’t these make a perfect classroom Valentine? What are your kids handing out this year?